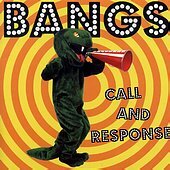 Girl-fronted punk rock that could wipe the floor with any band it wanted, Bangs' latest, the Call And Response EP, is a blazing, melodic, sing-along collection of anthems. It is the type of punk rock record you can put on at a party and dance too or sit and enjoy in the background while you carry on a conversation with another drunken patron, before interrupting the exchange when you find yourself singing along and tapping your feet. The irresistible, moving songs possess the pop prowess that makes great rock bands, and they know it, utilizing it at every turn. Creating something that is loaded with guitars, but not bogged down, ready to hit you at home or at the live show, and entice your senses with noisy rock that shines with just the right amount of pop. I'll give it a B.